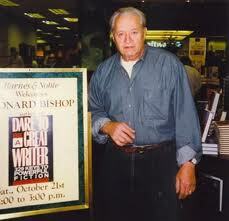 This entry was posted in Inspiration, nostalgia, slice of life, teaching, Writing and tagged American Novelist, best American novelists, Dare to Be A Great Writer, Humor, Leonard Bishop, mentor, middle school students, self-esteem in teenagers, self-expression, writing inspiration, writing talent, writing teacher. Bookmark the permalink. Thanks for the reminiscence. Bishop’s gift for benign challenge is part of what makes DARE TO BE A GREAT WRITER a unique writing book. Thank you, Mark. A great treasure in my life is the challenge he gave me to write, write, write!